Do you know that Bats feed the living ecosystem in the Dark caves of Malaysia? Recently during my transit in Kuala Lumpur and thought to visit a Batu cave which is famous for Lord Murugan statue. 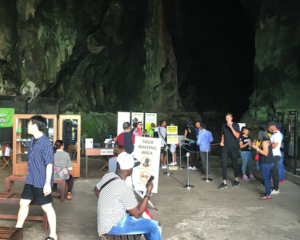 But to my surprise, I discovered the Dark cave conservation site which displays the limestone forming at Batu caves which are said to be 400 million years old. I find this as more interesting which explains how the life persists in dark caves where there is no sunlight and no plants can grow inside the caves. Then a big question is how the living creatures in this dark cave leading their lives and have their food? This explains the interesting concept of life ecosystem. There will be a ticket of 35 RM for adults and 25 RM for kids for one hour of education tour inside the cave. 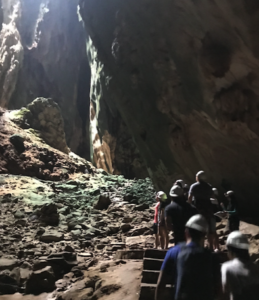 A torchlight and helmet will be provided while entering and a guide will accompany the team of tourists and explain the secrets of the dark cave. There are a total of 4 caverns namely A, B, C and D cavern. Only A and B are accessible to tourists with proper staircase build for walking and C and D are deep inside and no access to enter inside. 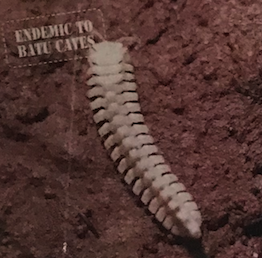 Batu caves, being a dark cave, the living creatures depend on the “Guano “ which is the excreta of the Bats which fly in and out of caves for food and excrete in the cave. Trapdoor Spiders ( Liphistius Batunesis ) which is 4 cm size depends on eating small flies estimated to be in existence from 360-286 million years ( MYA period ). Flatworm ( Dugesia Batunesis ) which eats organic matter which demonstrates bi-directional regeneration and can regenerate as fast as one to two weeks to turn into a miniature version of original flatworm. Blue Whistling Trush ( Myophonus caeruleus ) lives on worms and snails which habitats at Cave entrances. Light coloured Snail ( Prosopeas Tchehelense ) with a body length of 2 cm lives under rocks and damp shady places and eats guano, debris for the living. Spiny Milliped ( Ascetophacus Macdurei ) lives in the moisture of guano with a body length of 1cm and eats Fungi. The body resembles human spinal cord and the name follow it. Black Earwig ( Chelisoches morio ) with a body length of 0.25 ~0.26 cm, lives under stones in mud eats algae fungi and dead insects. Cave Cockroach ( Pycnoscelus striatus ) with a body length of 2 cm, can be distinguished by common house cockroach by bright marking on its thorax and stripes on the abdomen. 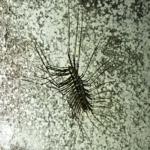 Long Legged Centipede ( Thereupoda LongiComis ) with body length up to 8cm, lives near limestone which eats smaller insects or hunts each other. A beautiful brown and white stripped predator with long legs. It has a breathing apparatus located in the middle of its back so that it can give enough oxygen when they run rapidly. 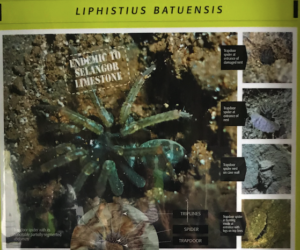 Pseduoscorpion with a body length of 0.35 ~ 0.45 cm lives under rocks, eats small cockroaches which occur in Batu caves where are most frequent in guano deposits. In addition to above, the species is Cave racer, Cave cricket, Tailless whip scorpion. 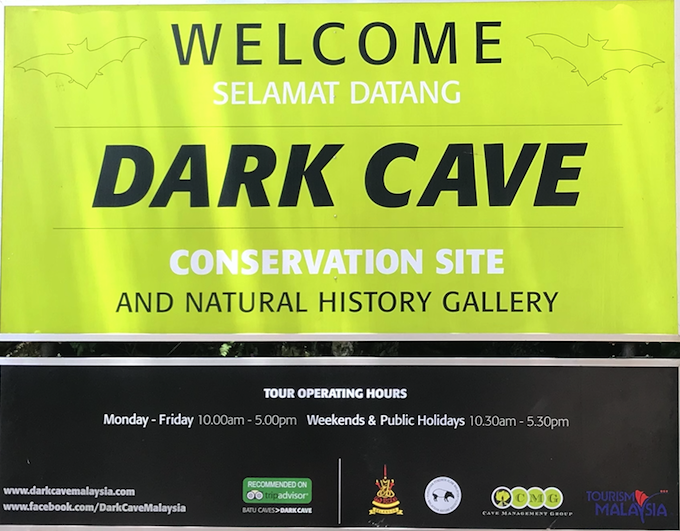 About 10 species of Bats have been recorded in the dark cave and two common species recorded are Eonycteris Spelaea and Hipposideros Diadema , as we already discussed, these Bats provide food to the living creatures in the form of Guano. Apart from spotting some living creatures along the way inside the cave, we can see the beautiful rock structures formed naturally due to Stalactite (formations that hang on the ceiling of caves ) and Stalagmite ( rock formations that rise from the floor ). Limestone stalactites form extremely slowly – usually less than 10cm every thousand years. This could be a very useful educational experience for kids for understanding limestone formation and how much time it takes to form a rock. Overall the tour of the cave took 1 hour with splendid experience of darkness with just torchlights in hand. It was adventurous as well as educational. Its unique guano-driven ecosystem was interesting with the ecological significance of rich scientific and educational interest. Moreover, this tour gives a sense of the importance of preserving the natural resources which take millions of years to develop. The below video gives a walkthrough inside the dark cave and the give a feel of the real experience while we were walking. It was a splendid experience. Best moment was the silence filled with bats chirping when we switched off torchlights and kept silent for few minutes. Try this when you visit next time. How to reach from Airport KLIA2? Use the KLIA Express and take a ticket to KL Sentral which will take 30 min to reach. Originally there is a direct train from KL Sentral to Batu caves which takes 20 ~30 min to reach. But currently the line in under renovation ( Feb 2018), and hence there is a free bus reaching Sentul and then we can take a train to Batu Caves from there. The destination is right outside the train station.